Ted Scherer, a chainsaw carver from Galloway, was asked by OSU representatives to create the newest Illibuck trophy. Scherer poses with his Illibuck inside of his workshop in Galloway. The rivalry between Ohio State and Michigan is one that runs deep through the hearts and souls of Buckeye fans everywhere. However, Michigan is not Ohio State’s only rival. There is another team with more at stake than rankings when they enter the Horseshoe. The battle for the Illibuck trophy began in 1925. At the time, the game between the Buckeyes and Illinois was one of the most widely anticipated games of the year for both teams. For this reason, it was decided that the schools needed to create a way to chronicle the competition between the teams. The idea, at first, was for a living trophy, and a turtle was chosen due to its long life expectancy. However, the only live Illibuck survived a mere two years before perishing at the University of Illinois. Since then wooden turtles have been used as trophies. Each year the score of the game is carved into the back of the Illibuck. The turtle is then passed to the winning team between the third and fourth quarters of the following year’s matchup. Several traditions surround the passing of the Illibuck, one of the most well known being that the turtle must be passed overhead and backwards, without touching the ground. It takes about eight games before the back of the Illibuck is crowded with game scores. When this happens, it’s time for a new trophy. Since it’s inception, nine Illibuck’s have made the journey between Ohio and Illinois. During the matchup between the teams on Nov. 10, the Buckeyes received the Illibuck as a result of their victory the year before. Next year, however, Illinois will take home the Illibuck for the first time since 2001. To add more salt to the wound, next year’s trophy will be brand new, and made by a Columbus artist. Ted Scherer is a chainsaw artist from Galloway. He began woodworking 30 years ago and picked up his first chainsaw in 1995. As a self-taught artist, Scherer has developed his skills into much more than a hobby. Working from a shop in his backyard, he has created hundreds of figures, from animals to cartoon and storybook characters, to lighthouses and more. While each of Scherer’s projects take on some special meaning to him, his latest accomplishment is not one that he will forget anytime soon. He was approached in September by members of The Ohio State University’s Honor Society and asked to create the newest Illibuck trophy. Scherer jumped at the chance. According to Scherer, the school gave him complete freedom to design the trophy as he saw fit. “They just asked me to make it smaller this year,” he said. 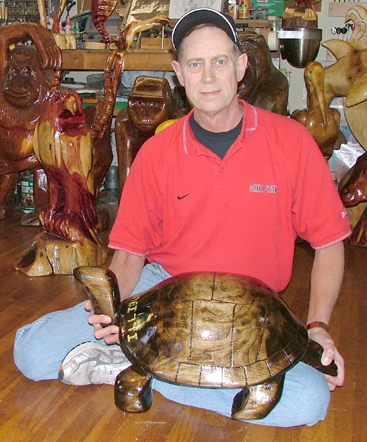 Having been approached to carve the score in the back of the wooden turtle in the past, Scherer has had the opportunity to study a previous Illibuck, and was determined to make this one stand out. 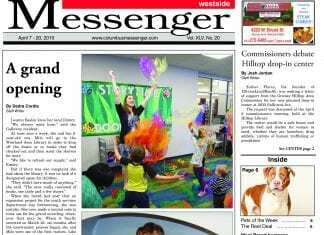 “I wanted to make it resemble a real turtle as much as possible,” said Scherer. He did this with subtle touches, such as the tilt of the head and the angle of the feet. Representatives from OSU had one other request for Scherer. They wanted the newest trophy made of black walnut. A dense wood, black walnut is extremely heavy. “I hear they have to pass it over their heads, so I hope they’ve got some big guys to do it,” said Sheerer. The newest Illibuck took Scherer approximately 16 hours to complete. “It’s definitely a nice feather to have in your hat,” he added. “Usually, when I look at a piece of wood, it speaks to me. The wood tells me what it is,” says Scherer of how his creations come to be. His work has been displayed at shows throughout Ohio. He has sold pieces to companies across the state, and he completed a custom design for a former player from the Cleveland Browns. While much of his work is completed in his workshop, Scherer also travels to the homes of customers, making custom carvings from tree stumps still in the ground. 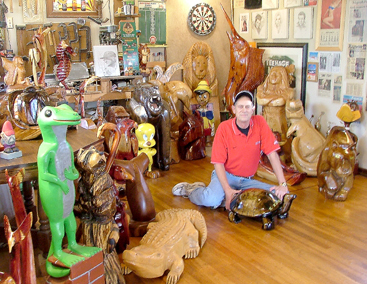 More information about Scherer and his work can be found by logging on to his Web site, www.ohiowoodart.com.